The tremendous advances made in the medical sciences over the past few centuries have been simply astounding. Much of this progress can be attributed to the efforts of diligent, talented, and sometimes just-plain-lucky researchers who set about looking for solutions to medical questions by applying the scientific method — which depends heavily on observing the results of controlled experiments to prove hypotheses. Animals, in their forced role as experimental subjects, have played a crucial part in this March Forward, as many important medical studies from the times of Pasteur and Pavlov to the present day, have been made with the use of test animals. Every year at least tens of millions of vertebrates (and so many more invertebrates) are used around the world in tests which end with these creatures being SACRIFICED. 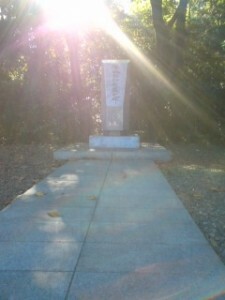 At Tsukuba University Medical School, as well as at other research institutes in Japan, the role that animals play in scientific progress, and the suffering often involved in their making a CONTRIBUTION to humanity (and sometimes to their fellow animals as well) does not go unrecognized or unacknowledged (for whatever that is worth) . Once a year, usually in the first week of November (when the climate is most comfortable), an announcement is made throughout the medical school complex, that a special memorial service (ireisai, 慰霊祭) will be held at the IREIHI (慰霊碑), a memorial tablet which is tucked away in the shadows of the small woods, just east of the hospital’s power plant. 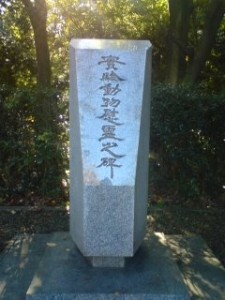 The IREIHI itself was made 20 years ago by a student of the university and the inscription on it reads “JIKEN DOBUTSU IREIHI”, or “monument for consoling the spirits of experimental animals”. On the day the ceremony is announced, hundreds of doctors, researchers, administrators, office staff and representatives of the companies which supply the animals attend, many bringing flowers, or foods which the animals might like. Since Tsukuba University is a government institution which must abide by rules separating church and state, incense, which would usually be offered on such an occasion, is not used, because of its overtly religious (Buddhist) connotations. Usually, a distinguished researcher or administrator makes a short speech about the number of animals sacrificed and the need to reduce this number and alleviate suffering. Those assembled then close their eyes for a moment of silence. I am told that many of those who attend this ceremony feel a sense of satisfaction or solace in having shown their respect and gratitude to the sacrificed lab animals. Some laboratories in Tsukuba affiliated with private companies hold more elaborate and overtly religious IREISAI. For several reasons, I, myself, do not like the idea of using animals for experiments (when it is not absolutely necessary to do so). But since millions of creatures ARE being used (and abused) in the name of science, I think it is a good thing to give them a little (even if it’s only on one day) RESPECT. Thanks to Dr. Sugiyama, director of Tsukuba University’s Center for Experimental Animals for giving me his time and for showing me his dedication to providing the best conditions possible for the animals under his care. Still I get the willies every time I pass his building. If anyone would like to attend the ceremony please let me know and I will inform you about it (on the day it is held).